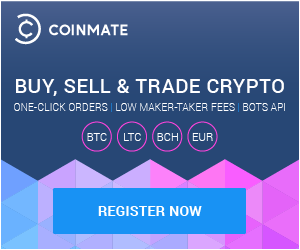 In 2014, when Coinmate was born, and first trades slowly started to emerge, new users were registering, and we all embarked on this journey, we weren’t even thinking about how its all gonna unfold. You kept trading, stalking the trade graph, fine-tuning bots, exchanging crypto. And we were stuck at our keyboards in day to day routines of getting the best we are capable of to you. But as the 10 billion BTC/CZK threshold was closing in these past few days, we just stopped for a minute in pure amazement. 10 billion! It is not only a huge number but also a sign that we did a good job. Coinmate is used daily by all of you, keeps adding new features, growing, but most important of all, buzzing with trading activity. Creating an environment for you all to trade, exchange, make money and hopefully, having fun doing it. There were some bumps on the road, but looking at the 10,000,000,000 BTC/CZK number makes us all forget that. Sitting down, we remember how it all started. And whether you are one of the first users or a new one, we hope we’ll double it together in the same manner as up to now. Keep it up folks, we will do the same here!